Technology firms that bankers once saw as rivals are now becoming business partners. For many years bankers have embraced the speed and lower costs that technology such as ATMs, websites and smart phones brought to their retail business. Now they are exploring, and beginning to embrace, the possibilities fintech brings to lending. The relationship is evolving so quickly that bankers report the rapid development of new financial technology, or fintech, can be dizzying. Along with ATMs and check-imaging technology that permits his customers to make deposits from anywhere with their phones, Withers also credits electronic customer statements and steady improvements in F&M’s core operating systems for helping him to cut costs and extend his brick and mortar branch network to neighboring counties during the last 15 to 20 years. Nonetheless, he remains a careful shopper because new technology doesn’t always deliver on its promises. Since the 1980s, when ATMs became ubiquitous at banks nationwide, financial technology has evolved steadily to meet customers’ increasing demands for the same one-click delivery of products and services they get from almost every other industry. For most of the past 30 years, the focus of financial technology has been on increasing the speed and lowering the costs of low-margin banking activities, such as balance inquiries, deposits, withdrawals and bill payments. Customers’ demand for more convenience has driven the development of more sophisticated ATMs, reduced the need for large brick-and-mortar branches, spurred the adoption of check-imaging, introduced better websites for internet banking and created more secure mobile applications for smartphone banking from anywhere at any time. One of the newest technologies at the drive-through windows across the nation are personal-teller machines, or PTMs. They connect customers to bank tellers sitting in remote locations via live-action video. Bankers say PTMs help banks reduce their employee headcount while keeping branches open longer for less cost. 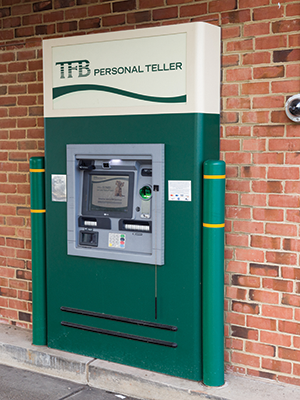 The Fauquier Bank (TFB) has installed PTMs for drive-through customers at a few of its Prince William County branches. Chip Register, the bank’s chief administrative officer, and Marc Bogan, the CEO, are pleased with the PTMs’ performance and plan to outfit them in all branches in Prince William by the end of 2018. Adding PTMs to the bank’s branches in Fauquier County will come later, they say. With new technology enabling banks to serve retail customers more efficiently, many bankers are beginning to focus on how fintech can help them with loans, the highest-margin segment of their business. That change in approach, say senior banking executives across the state, has been a long time coming. After the 2008-2009 banking crisis and Great Recession, new laws passed by Congress and much stricter regulations imposed by the Federal Reserve severely restricted the U.S. banking industry’s ability to make some loans. That crackdown on banks large and small coincided with the rise of online lenders, such as Lending Tree, Lending Club and Rocket Mortgage. These new players were able to provide customers with much quicker approvals on lending services ranging from car loans to five- and six-figure credit lines for small businesses and startups with less-than-stellar credit scores. Many online upstarts predicted their loan-making and pricing models soon would bury the traditional banking industry. They did not. Instead, fintech firms and banks are now becoming partners. “In the beginning, fintech companies saw themselves as [industry] disruptors, and banks saw them as competition,” says Matt Bruning, senior vice president for government and member relations at the Virginia Bankers Association. “Over time, each side has seen that they have strengths that can overcome the other’s weaknesses, and there is a lot more opportunity for collaboration. It has definitely evolved into a space where it is more collaborative and partnership-oriented,” he says. As a result, many Virginia banking companies have begun testing the fintech waters with modest initial investments in online lending applications. Others are still watching this evolving technology with caution. Tools to generate all sorts of online lending have caught the eye of Union Bank, Virginia’s largest community bank. Pure online lending “companies like Lending Club have proven customers are willing to use, willing to pay for a seamless, easy [loan] experience,” says Asbury, the bank’s CEO. “It’s going to cost you more than if you came to Union Bank, but people do it any way. People have demonstrated they are not as price sensitive as you might think. What they value is the ease of experience, the quick decision you can get from a company like Lending Club. “We are very interested in this,” he says. 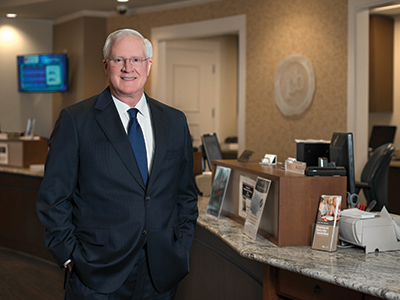 Steve Yeakel, president and CEO of the Virginia Association of Community Banks, says many of his member banks are now ready to make investments in online lending. “The banks that are interested in doing something substantial are just now coming to the end of a solid due-diligence process,” he says. Slightly ahead of the pack, The Fauquier Bank has introduced two fintech platforms in the past eight months. The first, MinuteLender for small, unsecured loans, began in mid-2017. Barring any last-minute snags, the bank planned to activate the second platform, SuperNova, in January. Using predetermined credit limits of up to $30,000 for consumer loans and $75,000 for business loans, The Fauquier Bank’s version of MinuteLender uses an existing customer’s FICO score (a credit score used to determine lending risk) and deposit history to approve a loan request in minutes, making the money available to customers within three days. The Fauquier Bank’s version of the SuperNova secured lending platform allows the bank to connect with high net-worth individuals who want to borrow $25,000 to $250,000 against their portfolios of secure financial assets — including real estate, stocks and bonds — without having to sell part, or all, of their nest egg. Bogan, the bank’s CEO, wants to use different fintech tools to enter other unsecured lending markets, like credit card fulfillment. He also is eager to use technology to streamline and expand the bank’s burgeoning secondary mortgage business and attract deposits to grow its capital base, which stood at about $650 million at the end of last year. “That’s something we can logically look at going into the future,” he says. Looking ahead, some Virginia bankers want to explore lending and payment businesses that got their start in cyberspace. “A topic that has my interest is peer-to-peer payment solutions,” for consumers and businesses involving banks, says Harrison of Virginia Partners Bank. The bank now offers its customers in the Fredericksburg area and in La Plata, Md., the option to open bank accounts and apply for consumer loans online. Choosing a fintech product likely won’t get easier. Vendors constantly offer banks a steady stream of new products and updated variations of older ones. 2 Subsidiary of Capital One Financial Corp. Capital One Bank is located in Virginia, but it provides banking across the U.S.
3 E*Trade Bank is located in Virginia, but its office provides online banking across the U.S.
4 Xenith Bank was acquired by Union Bank & Trust in January 2018.